The range of the Kenya crested guineafowl is Somalia, Kenya, northeastern Tanzania, and on the islands of Zanzibar and Tumbatu. Kenya crested guineafowl inhabit scrub or dense thickets and grass. Eggs are Incubated for 23-28 days. Kenya crested guineafowl are monogamous with strong and long lasting pair bonds. They are generally sedentary, but can cover considerable distances during daily wanderings. 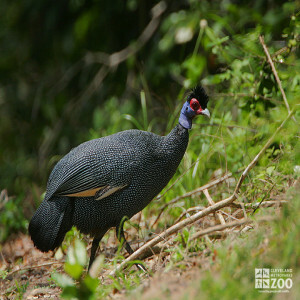 Kenya crested guineafowl lay their eggs mainly during rains, but throughout the year in equatorial zone. The nest is a scrape on the ground with sparse lining, mainly of dead leaves and grass, usually well hidden. Chicks have down that has dark longitudinal stripes. They can fly at about 12 days, and are fledging at about 30 days.